Angel Hearts was founded by Kie in September of 2003. She was a huge fan of J-pop and wished to have a group of dedicated cosplayers to sing and dance with. She gathered a few friends, and Angel Hearts made their debut singing J-pop songs by ZONE and Hello! Project at conventions in Southern California. In early 2007 the first IDOLM@STER console game was released, and Angel Hearts became instant fans -- in fact, they did their first IDOLM@STER performance the same weekend the game was released. The game seemed to be a perfect setup for cosplay performances: cute girls, catchy songs, fun dances, and endless costume choices all packed into one anime-style video game. 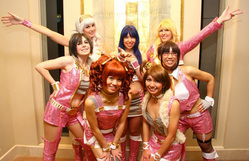 Angel Hearts hopes to do many more performances at conventions all across California. We do our best to smile and have fun, and hope you'll enjoy our shows!